Closed Beta is just around the corner for My.com’s upcoming free-to-play MMORPG Revelation Online. 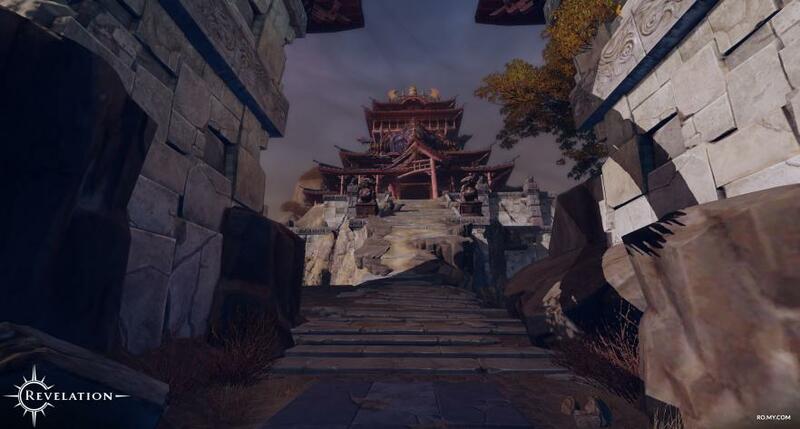 With testing starting on November 3rd, the game has seen quite a bit of press hype detailing many items of the game’s content. Today’s reveal continues a previously started chain of content available in dungeons. Players level 35 and above (some higher difficulties may require a higher level be obtained first) will be able to take on the tasks awaiting them in the Misty Hollow and Deserted Shrine dungeons. Misty Hollow comes in two difficulties:Trial Mode and Normal Mode. Each difficulty has a one run per day cap but each difficulty also has a different level requirement. This dungeon functions as a survival type encounter similar to The Violet Hold for you World of Warcraft players. 16 waves of monsters are trying to break the seal on the dungeon and escape (20 waves on Normal difficulty) and your team has to slay them all ending with an encounter against the Spider Queen. The Deserted Shrine is a more traditional dungeon with multiple bosses and 3 levels of difficulty each with its own level requirement and daily run limit. You can check out the full preview here and if you missed the first Revelation dungeon reveal you can get caught up here. This game is going to be really fun and awesome 😀 played it to lvl 40 on the china server where its “pay2win” didnt find any problems with the model might be a little pay2win but seems ok to me its just you can buy the best gear with money but you can craft it 2 (best gear in the game is crafted by players) .Model for the west seems really cool and its a good thing that its not hyped up as much as archage2 was and turned out to be crap but looking at it this game might be the mmo of the year with a lot of crafting pvp and pve content like pve content is insane and pvp has 1v1 2v2 3v3 5v5 battlegrund with 40+ and massive guild battles with 100+ players able to join the is a Youtuber that spent a lot of time in the game and done a lot of video his name is Cryy you should check him out if you want more information. This game is heavy p2w. Stay away of it or you will regret it later. Want some example? Really? But I doubt I will play it anyway. But this game looked like one of the better games in my opinion. I wonder how much longer my.com plans on stretching these… “testings” of theirs. Not enough whales spent on packs yet? hm? They stretched it once what are you talking about? Kinda why I gave up on MMO’s I got tired of the BS I’m mostly here now since I review them.